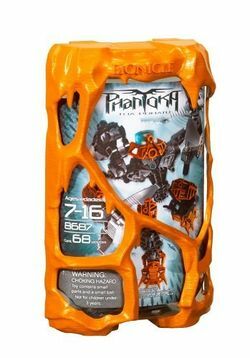 8687 Toa Pohatu is a BIONICLE set released in January 2008. It is one of the Phantoka sets. It contains Pohatu, his twin propellers, and his Midak Skyblaster, with 4 Midak Spheres. It can connect with 8946 Photok and other Matoran. This is a description taken from LEGO.com. Please do not modify it. (see an archive of the product's page) The power of stone! Using his massive propellers to fly through the sky or bash his enemies, Pohatu Nuva is as tough as they come. His Mask of Speed and shoulder-mounted Midak Skyblaster make him a devastating fighter. Combine with 8946 Photok for more action in the air! Pohatu Nuva stands 6½" (16.5cm) tall! Facts about "8687 Toa Pohatu"
This page was last edited on 28 April 2016, at 17:59.